Happy New Year!! I hope you had an amazing night and partied the night away, I know I did. Last nights dinner was a wonderful and well earned bacon-cheese burger with fries and a large Faxe Kondi soda. And it was gooood. 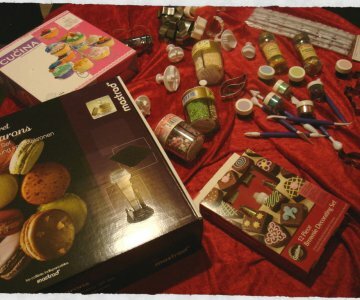 We spent New Years Eve with friends in Vanløse, near Copenhagen. It was such a fun night with amazing food and great great company. 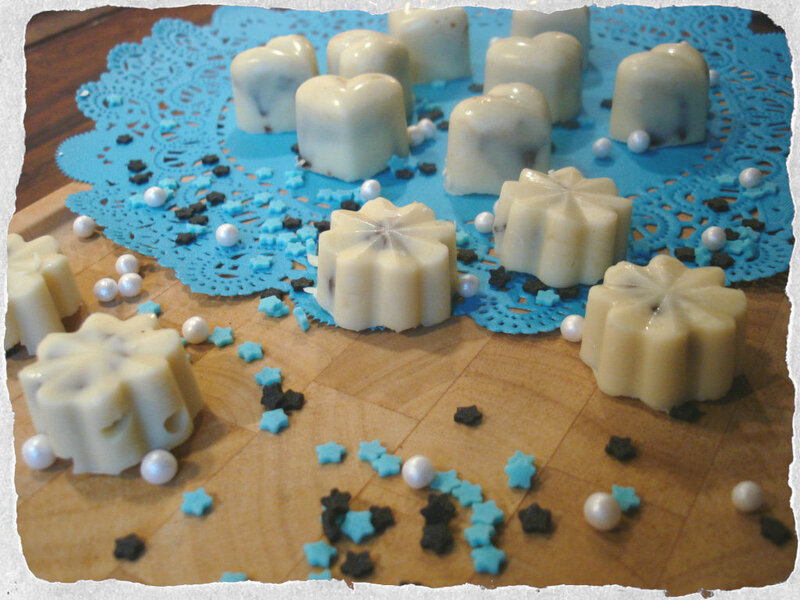 I made a batch of homemade chocolates and brought them for the party. 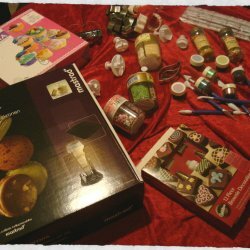 I had actually planned on bring both a batch of white chocolates and a batch of truffles, but the truffles never set as well as I would have liked. So I combined the two. 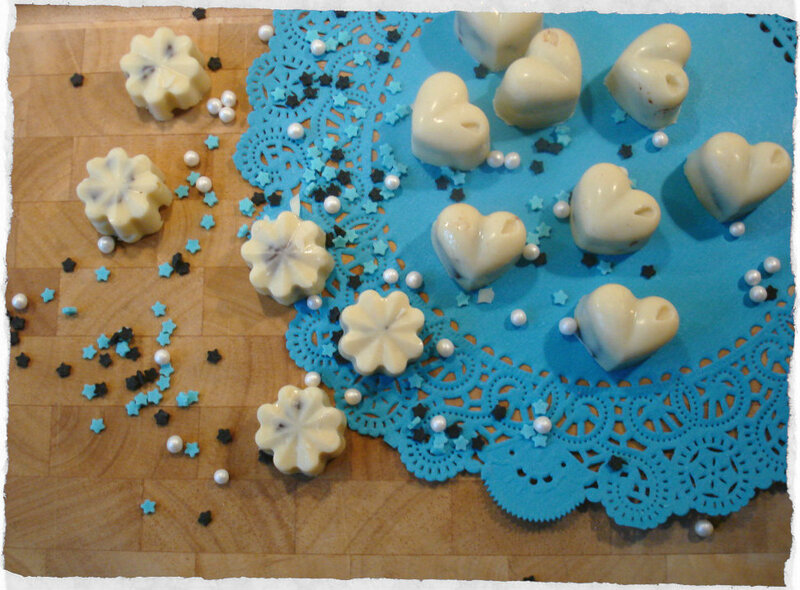 And so here is the recipe for homemade white chocolates with dark chocolate mint truffle filling. Pour cream into a saucepan. Lightly bash the mint sprigs with in a morter to release their fragrance and add to the pan. Heat very gently for 5–6 minutes to infuse the cream with the mint. Meanwhile, break up the chocolate and place in a heatproof bowl with the diced butter, honey and syrup. Strain the hot cream through a sieve onto the chocolate, butter ,honey and syrup, stirring as you do so; discard the mint sprigs. Continue to stir until the chocolate has melted and the mixture is smooth. Pour the mixture into a shallow pan. Place in the fridge for a couple of hours to set. Once it has set, melt the white chocolate over a bain marie (or water bath if you will). Start with about 400 g and once that has melted take it off the heat and add the rest of the chocolate, letting it melt as you stir. Now take your molds and fill each hold. Fill approx. one teaspoon of melted chocolate in each “hole” in your chocolate mold. 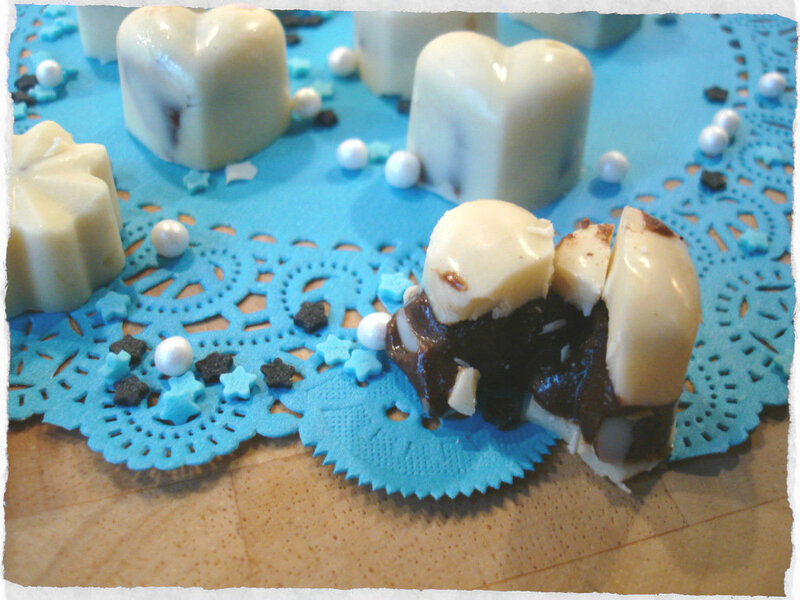 Turn the mold around a bit so the chocolate slides up the sides of each hole. If necessary, add more chocolate. Set the molds aside and let the chocolate set a bit. 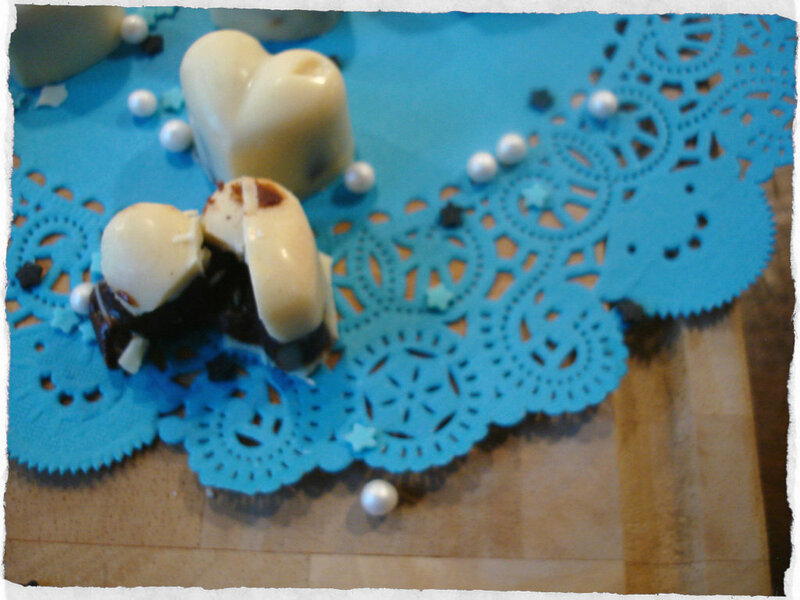 Now take your truffle mix and add a small ball into each hole in the chocolate molds. 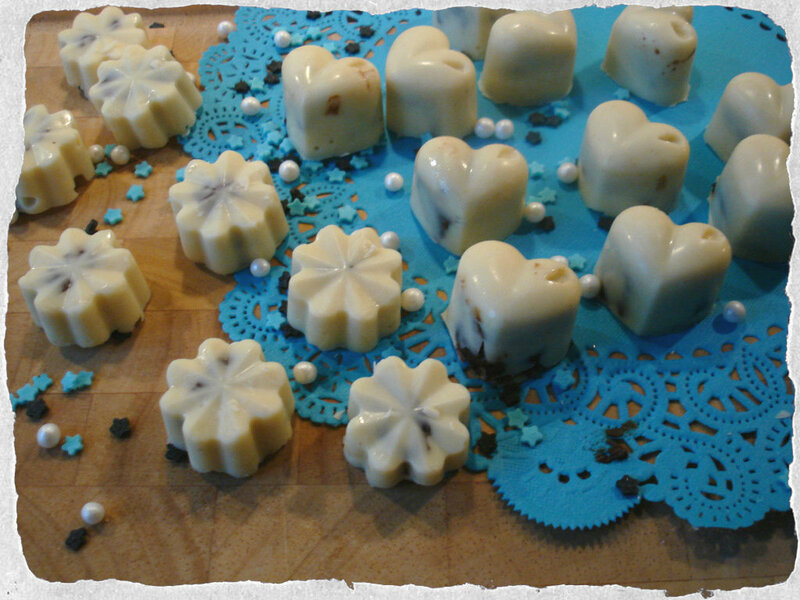 Finish up by filling each mold with the remaining melted white chocolate. Place them in the fridge for an hour and allow to set before having taste.